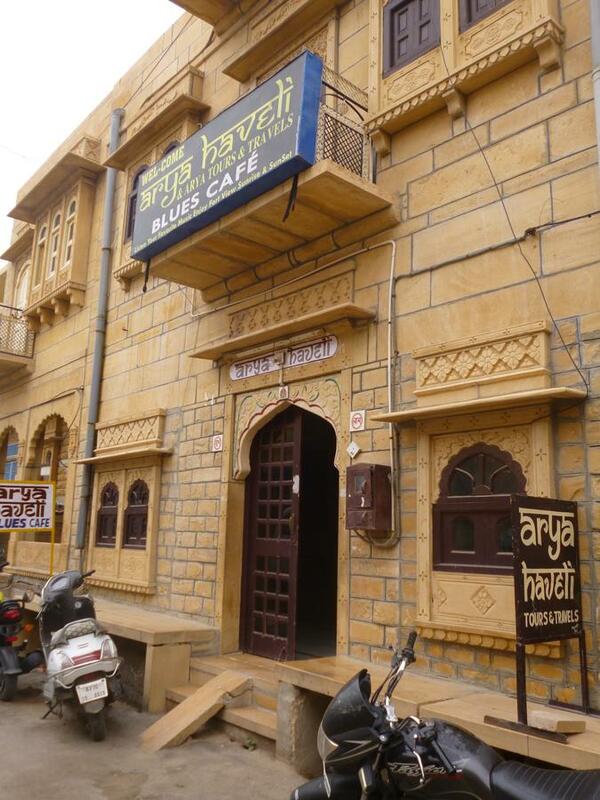 Arya Haveli is located in the center of the beautiful and historical city of Jaisalmer. The city is built with yellowish sandstone and is known as "The Golden City". 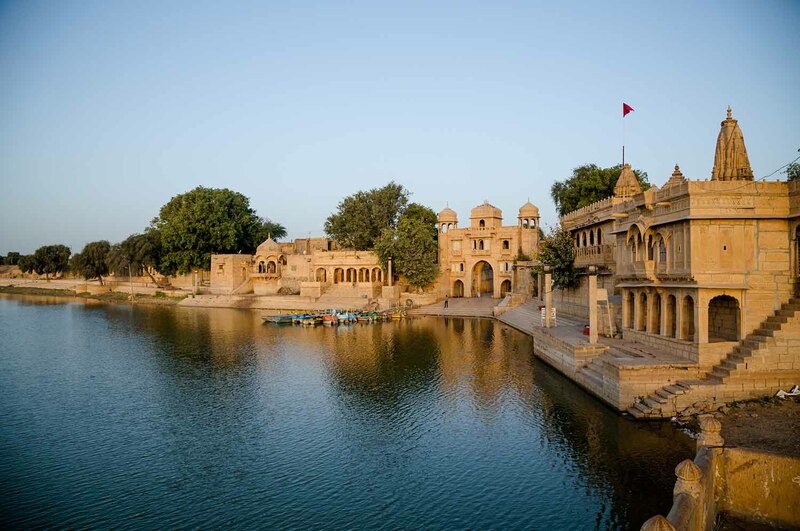 In the heart of town, Jaisalmer has a fort that is over 800 years old, which contains palaces, several ornate Jain Temples, havelis built with beautifully carved sand stone. Desert safari in Jaisalmer is considered the best way to explore the "Thar Desert". Jeep or Camel are two ways to explore the desert. 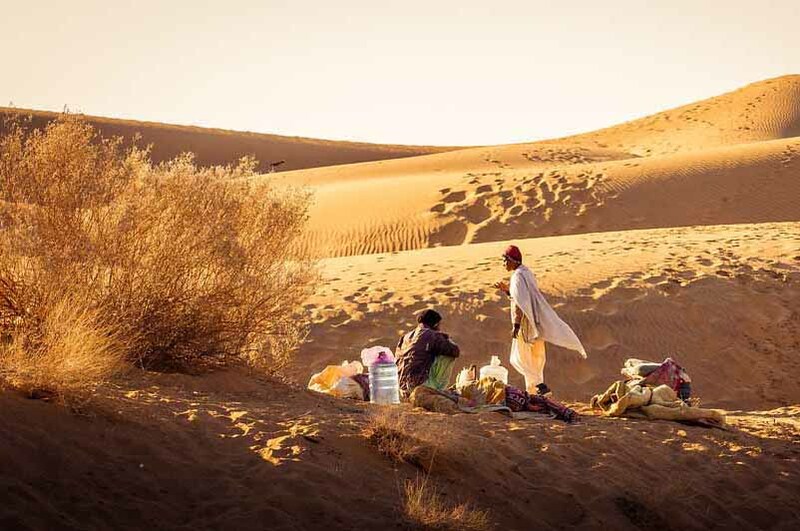 You could choose our pre-designed packages or we could organise the Desert Safari is depending on your desires, the time you have and how adventurous you want your desert experience to be. 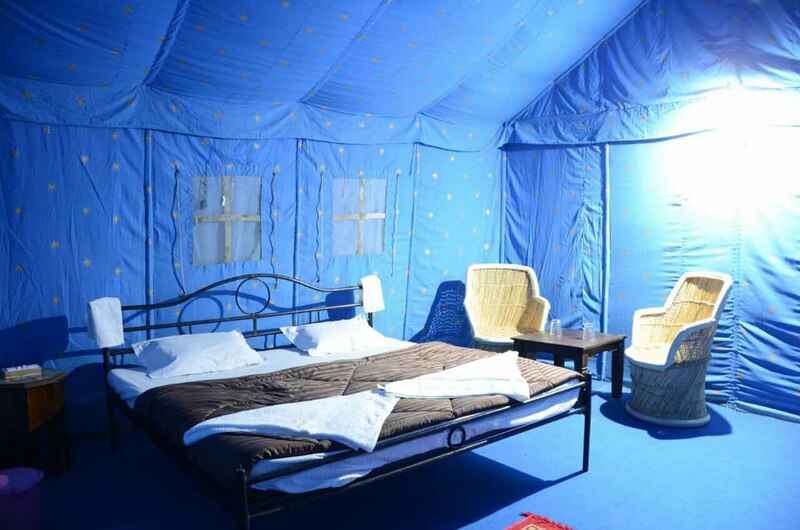 If you wish to stay in a luxury tent after your camel ride, we could organise your desert luxury tent stay with us in beautiful Thar Desert. A typical desert safari tour will start around 2.00 pm by a jeep. 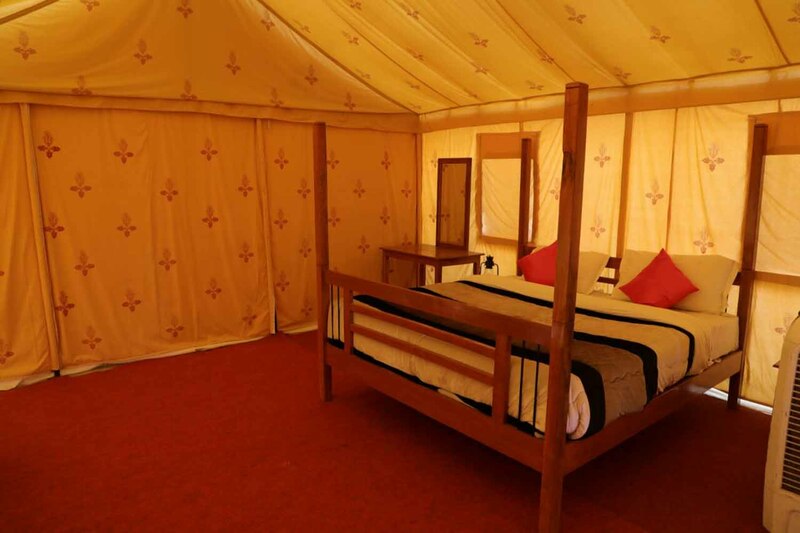 to reach to camp area where we will have a beautiful tent with all the modern facility available for you. 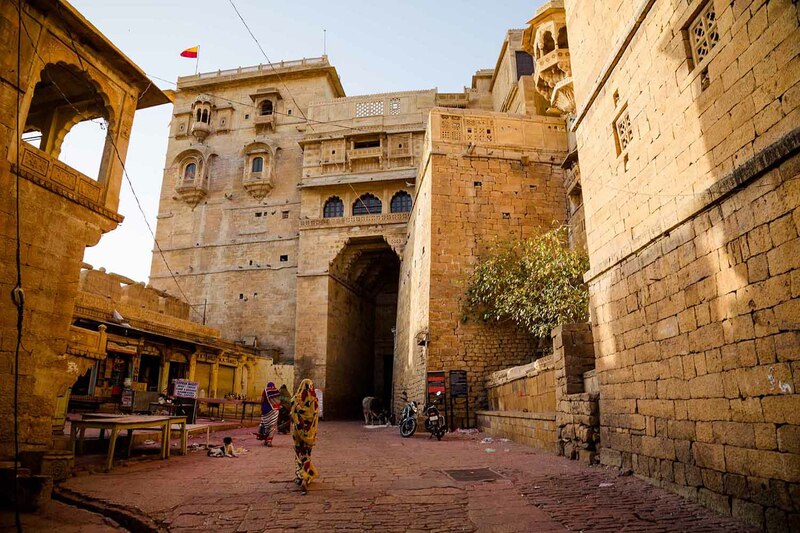 Our hotel in Jaisalmer is located away from the hustle of the busy city, yet only a 5 minute walk from the fort gate; in a very safe, quite and peaceful street. 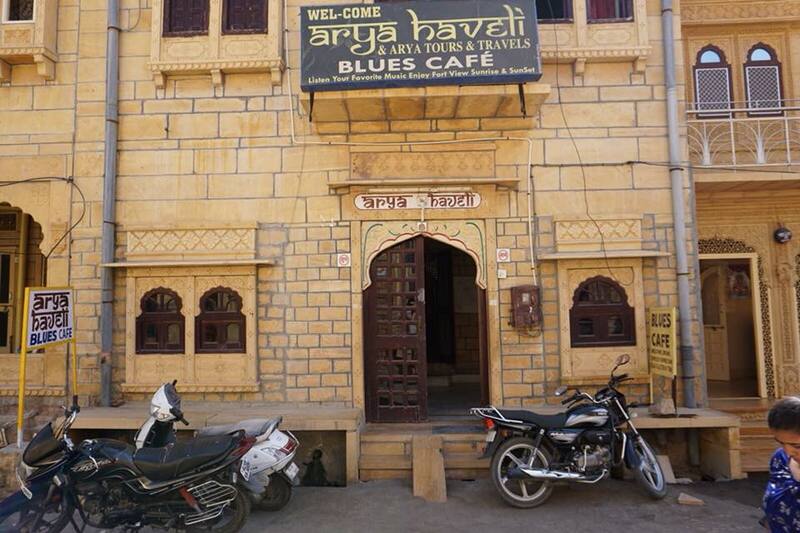 The building was converted from a Haveli (traditional house) into a nice cozy guest house. It is just a minute's walk from Gandhi Chowk, which is the center of the city. You get a stunning view of the historic fort and the sunset over the sandy coloured stone buildings, from our roof top cafe, while you have a fresh juice or a cup of coffee. Our hotel rooms are spacious and comfortable. At our roof-top restaurant in Jaisalmer - Blues Cafe, we provide a fine menu selection of Indian food throughout the day, including breakfast, lunch and dinner. Wifi internet is available to our guests. We also have a small bookstore, so you will not get bored! 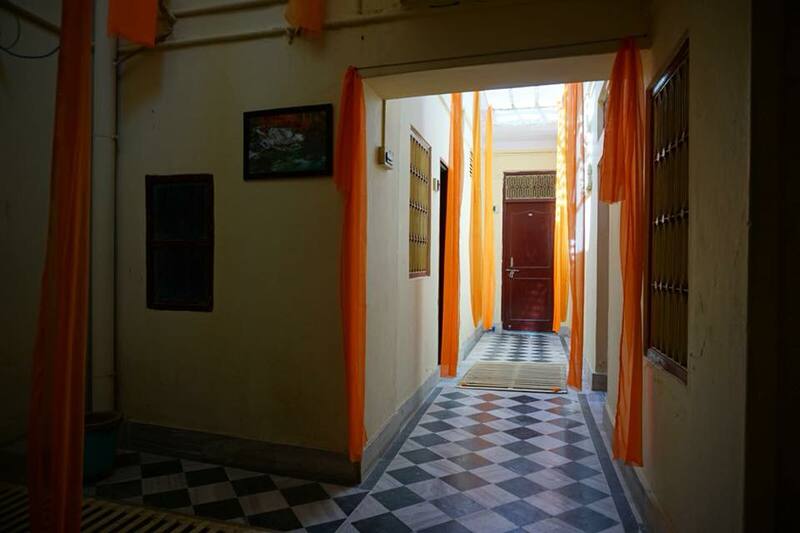 All our staff are well experienced and will make you feel comfortable and welcome during your stay at Arya Haveli. 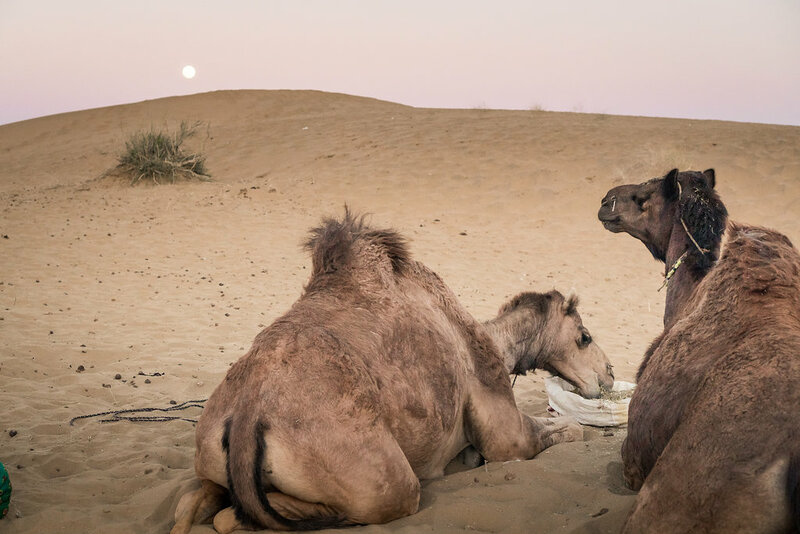 We have been organising camel safaris in Jaisalmer for the last ten years and will gladly organise a trip to take you to our beautiful private sand dune, for an amazing desert safari experience. Super friendly host, cozy rooms, and a very chill atmosphere. 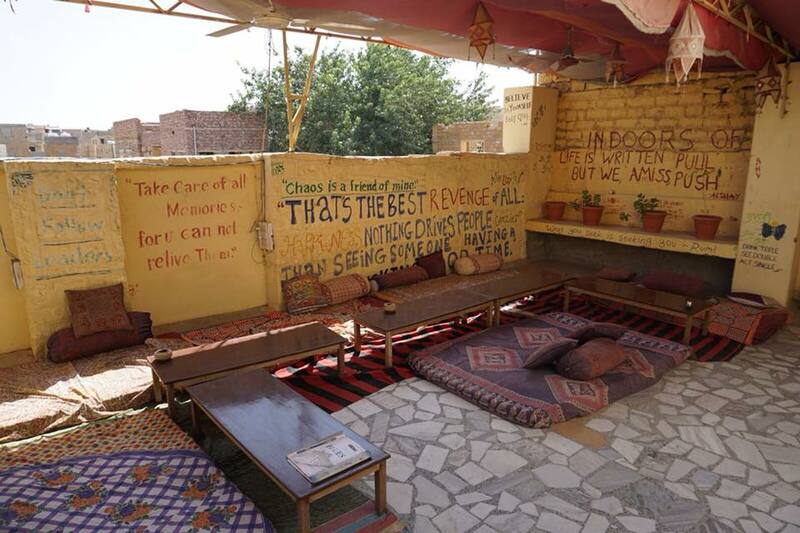 Great place to stay while you explore Jaisailmer. Om will take good care of you and help you with your travel plans and any questions you might have. Thanks for the memories Highly recommend! 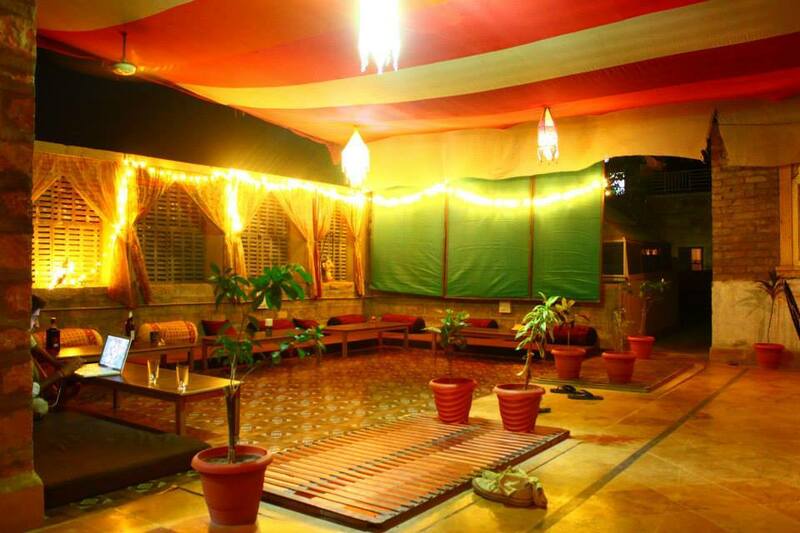 it's nice to experience like haveli at very low cost. they are providing good safari package as well. it's very go od place to enjoy with your friends. go for at least one time. Om, the owner was also very helpful. We will start the tour with jeep ride to desert, visiting monuments and villages on the way. Jeep will drop us on a camel pick-up point and we will have an hour and half camel ride to go to our Sunset point. After watching a beautiful sunset over the sand dunes, we will have dinner and return to hotel by Jeep. 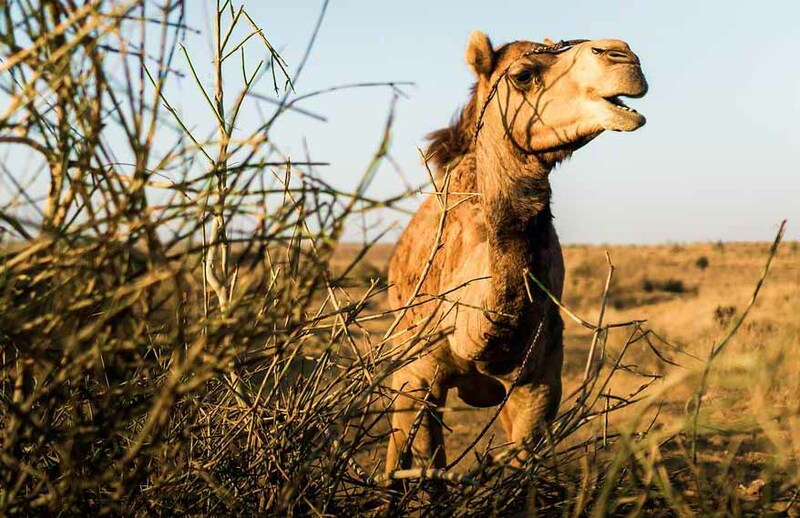 * The tour could also be organised without camel safari and you visit the sunset point by Jeep directly. We will start the tour with jeep ride to desert, visiting monuments and villages on the way. Jeep will drop us on a camel pick-up point and we will have an hour and half camel ride to go to our Sunset point. After watching a beautiful sunset over the sand dunes we will have dinner and sleep under the stars over the sand dune. Next morning after a lovely sunrise and breakfast we will return by jeep to our hotel. We will start the tour with jeep ride to desert visiting same as overnight tour & then go to our lunch point under a tree in the dunes. 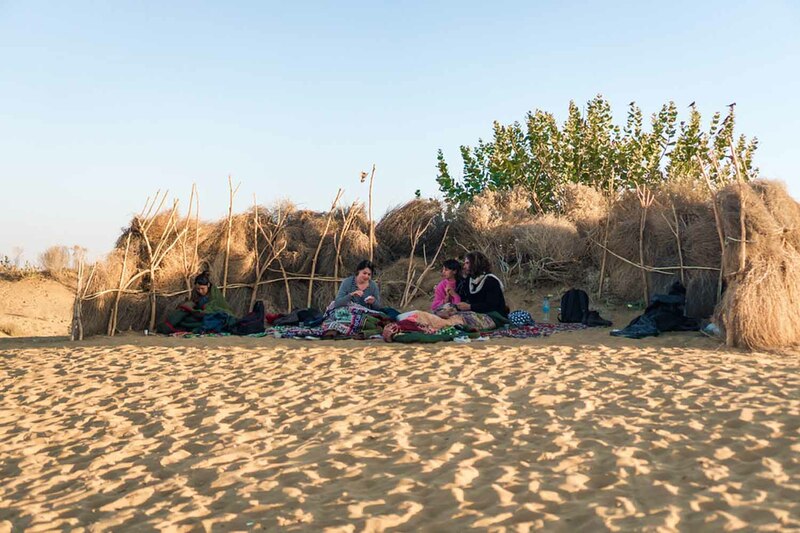 We will continue our camel ride after lunch exploring more of that desert at sunset point where we will watch a beautiful sunset & enjoy dinner, campfire and sleep under the stars over the sand dune. Next morning after a lovely sunrise and breakfast we will have another camel ride to go to jeep poiint.